Montana Test.com - Results for: Brinkman Spotlights and Flashight! Reviewed! We received four distinctive lights from Brinkman three spotlights and one flashlight. This was our first leap into spotlights, three worked well and we continue to use and one we had persistent unresolved problems. 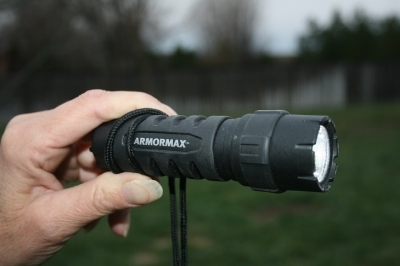 First the good news, the Armor Max 140 Lumens LED 3AAA Flashlight, the NEW Q-Beam LED Rechargeable Spotlight with Red LED Night Vision, and the Tuff Max LED Dual Spotlight are hardy and continue to function perfectly. I exhausted the Armor Max flashlight duck hunting all reason in all kinds of weather. I have yet to change batteries. I put a lanyard on and hung around my neck. I still use a headlamp for hands free but keep the flashlight when I needed a hand to guide the light when necessary. I still use it today and am impressed with quality. Beam distance is 145 meters, 475 feet, or 158 yards. Not too bad for this little light. See specs below. The Brinkman Tuff Max LED Dual Spotlight, worked but you want to be attentive when replacing batteries. It takes six and make sure you insert correctly. It is a great little dual spotlight and has adjustable heads, a nice feature. I tagged it my around the house spotlight for night time work and play. The top head is brighter than the lower to save power. It is a comfortable handheld and runs some distance. Beam distance 320 Meters, just less than 1,050 feet and 350 yards. See specs below. 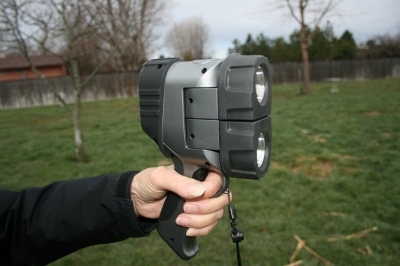 The New Q-Beam LED Rechargeable Spotlight with Red LED Night Vision was field tested by my son Chris and I spent a good time with it. If are looking for distance this spotlight delivers. The Red LED Night Vision is acquired by of push of a button and worked great. The New Q-Beam has eight hours of run time and a lockout switch for accidently turning on and leaving on. This is an outstanding big spotlight that we tested and we still use today. See specs below. 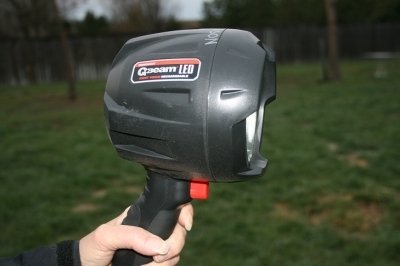 The Q-Beam Big Max III Rechargeable was the big boy of the four and gave us problems from day one. The battery charger did not work and I called and received a replacement. The second one worked but not for long. The Big Max III for some frustrating reason would not take a charge from the AC adapter or the second 12V charger after about a month of periodic use. My son returned to me and gave me the discouraging news and I tried to get it to take a charge with absolutely no success. Dual adjustable heads (45 degree each) for all lighting needs. Tough, durable construction with rubber accents. Beam Distance: 320 meters (25-lux ANSI standard).